This coffee business has had the unexpected blessing of getting me to ask questions about the old days. It’s still a bit fuzzy in my mind. The oldest child and #1 son, Uncle Harold, or UH, as he refers to himself to his nieces & nephews, told me his days as a coffee farmer were over at age 14. 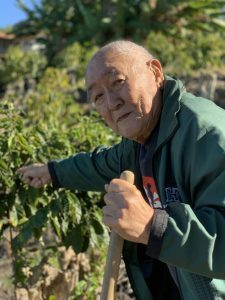 He had ideas of how to improve coffee farming, but Grandpa wanted to do it the way it had always been done. 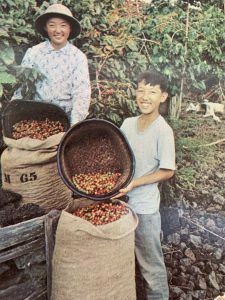 When our grandparents later divvied up coffee land amongst the adult kids, UH declined; he was college educated, was living on the mainland and wasn’t going to be a coffee farmer. Good thing for me. UH was the link between my parents. UH and my dad worked together as civil engineers in Northern California. When Mom went to university on the mainland, she spent school vacations with her big brother, and Dad just happened to be around (wink wink). 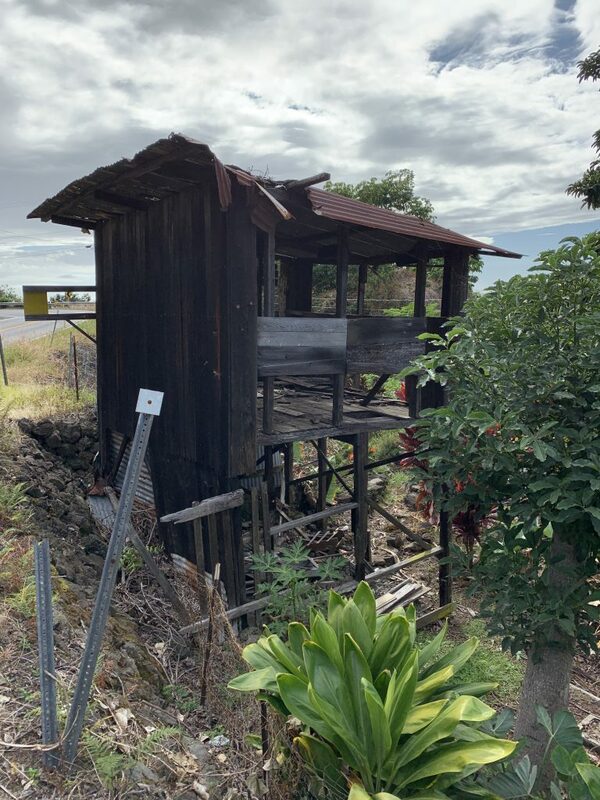 As UH told me … our grandfather’s father acquired a small convenience store (the building in the photo) on 3+ acres of coffee land. Then, Grandpa acquired another 3+ acres directly across the highway. Then he acquired another almost 4 acres. Grandpa later sold the first two properties to finance the education of his children. The third parcel, Grandpa subdivided and Bea’s Knees Farm is the majority of that parcel. The family picked coffee and hauled the bags of coffee cherries by donkey and the kids’ young backs to the kuriba. Most farmers built this simple facility on their property. Mechanization was minimal in those days. The photo shows our family’s former kuriba as it looks today, now dilapidated. It’s another family’s property now. It’s next to the former Murata store/house. At the kuriba the red fruit was pulverized and put into an overnight fermentation box. In the morning the beans were washed, put on conveyors for spreading on platforms called hoshidana for drying in 3-4 days. After harvesting, they fertilized and pruned the trees. Weed control was by herbicide and by hoeing. One of UH’s additional chores was moving their donkey around to various grazing areas. 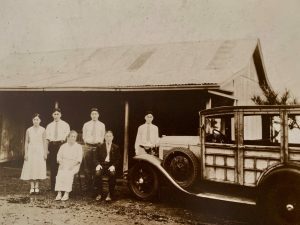 At that time, the final product from the family was parchment, which was sold to American Factors Limited in Kailua Kona. They processed the parchment to green beans (unroasted coffee). And what kind of coffee did our grandparents drink? By the time I was around and aware, it was Folger’s instant coffee. Kona coffee was too expensive. Sharlene, This is an interesting, fun-to-read post. Thinking about the size of the farm takes me back to my youth when I had some exposure to farming in the midwest. At that time, 50 years ago, a farm of 100 acres was considered a hobby farm and financially unsustainable. I’m sure that acreage number is much larger today. So I conclude that the margins on coffee beans is substantially higher than those of soya and corn. Love this post!! Do you know the year your great grandfather bought the first parcel? Such an interesting history and family lore.